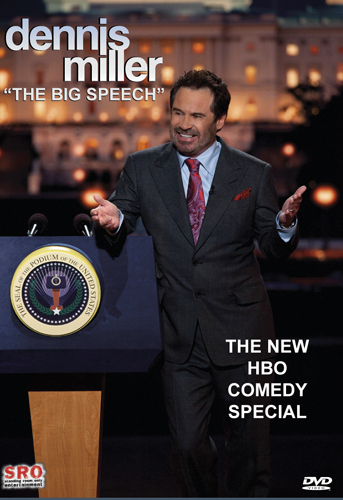 Comedian Dennis Miller returns to HBO with his eighth stand-up special Dennis Miller: The Big Speech. Miller takes to the podium with thoughts on the 2010 midterm elections, global warming, dinner with Frank Sinatra, “Obamacare,” Nancy Pelosi, and more, along with bonus footage not seen on cable. 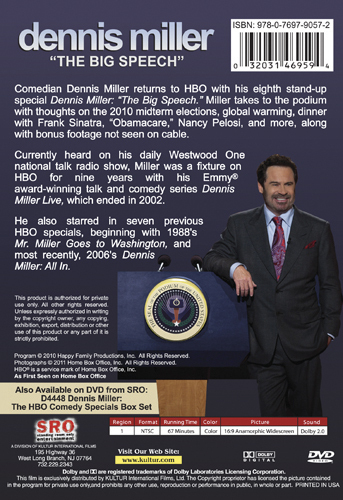 Currently heard on his daily Westwood One national talk radio show, Miller was a fixture on HBO for nine years with his Emmy® award-winning talk and comedy series Dennis Miller Live, which ended in 2002. He also starred in seven previous HBO specials, beginning with 1988's Mr. Miller Goes to Washington, and most recently, 2006's Dennis Miller: All In.